The background of Roger Sherman Baldwin is impressive. His father, Simeon, was a New Haven lawyer and congressman, and his mother, Rebecca, was the daughter of Roger Sherman, a signer of both the Declaration of Independence and the Constitution. Baldwin attended New Haven’s Hopkins School, named for Connecticut’s second governor, Edward Hopkins, and he graduated from Yale in 1811. After completing studies at the Tapping Reeve Law School in Litchfield, he was admitted to the New Haven Bar in 1814. Unlike many lawyers in his day, Baldwin did not join a law partnership, and he did not work out of his home. Instead, he opened his practice in New Haven’s business area. Baldwin married Emily Perkins of Hartford in 1820, and they had nine children. One son, Simeon, later became governor of Connecticut. Baldwin’s legal skills and great diction earned him many clients and distinction at the bar. However, he was also concerned about the less fortunate. Like his father, Baldwin was an ardent opponent of slavery. Early in his career, he defended and secured the freedom of a runaway slave. In another instance, Baldwin, along with Simeon Jocelyn, a prominent abolitionist, confronted an angry crowd of people who opposed the building of a training school for blacks in New Haven. When Baldwin decided to defend the African prisoners in the Amistad case, he gained national recognition. The Amistad was a Spanish slave ship that was illegally transporting recently captured Mendi Africans to Cuba when the Mendi on board revolted and gained control. Two crewmembers were kept on to navigate the ship back to Africa. However, at night, the crew secretly steered the ship northward. After almost two months at sea, the Amistad fatefully pulled into a secluded spot on Long Island Sound for provisions, where the ship was seized by an American naval vessel and escorted to Connecticut. Charges, including piracy and murder, were filed against the Mendi. However, because the Africans had been captured and transported against their will, the legal wrangling soon began. Some wanted them returned to Africa as free men. Others felt that the captured blacks were slaves. Spain demanded the return of the ship and cargo. The political climate of the United States at that time quickly made the incident into a large, international one. Having initially been placed in a New Haven jail, after a few months the Mendi were transferred to a barracks at Farmington, Connecticut, where they were relatively free. Their fate was eventually decided in a very complicated legal case that took two years and the United States Supreme Court to resolve. Abolitionists wanted to defend the Mendi, and when wealthy New York merchant Lewis Tappan offered financial support, they were able to look for the best legal talent available. Their final choices were Roger Sherman Baldwin and John Quincy Adams, the former President of the United States. Before the Supreme Court of the United States of America, Baldwin gave compelling legal arguments centering on the basic liberties of human beings and the free status, especially in the United States, of the illegally enslaved. His presentation was considered impressive. John Quincy Adams capped it with a moving summation, the final touch in persuading the Justices of the Supreme Court in the spring of 1841 to make the Mendi captives free people once again. Throughout his lifetime Baldwin was active in three political parties, which indicates how fluid politics were in Connecticut. He was a Federalist until that party ceased to exist after 1818. 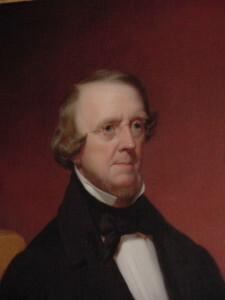 He then became a Whig and served in Connecticut’s Senate (1837-1838) and House (1840-1841). He was nominated for governor in 1843 as a Whig but lost to Democratic candidate Chauncey F. Cleveland. Baldwin received 25, 401 votes compared to Cleveland’s 27, 416. In 1844, Baldwin and Cleveland both ran again, and that election was close as well. Votes for Baldwin numbered 29, 863, while Cleveland received 28, 846. Although Baldwin had a little over a 1,000 votes more than Cleveland, he needed to be selected Governor by the General Assembly since he lacked the required 50 percent majority of the popular vote. Baldwin won the 1845 election outright with 29,508 votes against Isaac Toucey’s 26, 258. During Baldwin’s term as Governor, much of the country was absorbed with concerns surrounding the annexation of Texas and the upcoming Presidential election. Despite a focus on national affairs, Baldwin’s administration succeeded in bringing about much needed educational reform. The public school system in Connecticut was disorganized and ineffective for most students. Instruction varied greatly from school to school, as did the skill of the teachers. The school sessions were often irregular and student attendance was not closely observed. In order to address the need for standardized teaching methods, a new Committee on Education was formed under a State Superintendent of Schools. The Superintendent was responsible for investigating the existing school situation and recommending solutions to the legislature. The creation of this office recognized the importance of education and paved the way for future reforms. The late 1840’s saw the beginning of what were to be massive waves of German and Irish immigration to the United States. Connecticut had old laws that restricted how much land a foreign-born citizen could own. Baldwin and the Connecticut Legislature, in an almost prescient move just as these waves of immigrants began to arrive, implemented laws to reduce the restrictions. This was helpful later on, when the state’s growing manufacturing concerns employed many immigrants. Baldwin is also remembered for his work in election reform. Fraudulent election practices, such as double voting, were common before Baldwin’s term. Baldwin helped reinstate a law that required voters to register with local officials, which eliminated some of the corrupt practices. Most of all, Baldwin is known for his fight against slavery. Slavery was a source of great controversy in national politics, and by Baldwin’s term as governor, there had been many years of debates between states on the subject, debates which would finally lead to the Civil War. Baldwin did what he could to fight slavery in Connecticut. In 1838, he helped pass a law that required those who captured free blacks and then claimed that they were their runaway slaves, to prove this in court. In 1844, he sought a law to end slavery in Connecticut and one that would permit free blacks to vote. Neither request was honored by the Legislature during his time as Governor, but Baldwin did gain a victory in 1848, two years after he left office, when slavery was abolished in Connecticut. That same year, the General Assembly also passed a law exempting free blacks from paying certain taxes. Baldwin recommended a number of other reforms pertaining to prison labor, temperance, bankruptcy, and elections to the General Assembly that were generally ignored by the legislature. The ongoing stalemate between the Executive and Legislative branches came to a head when Baldwin vetoed a bill involving a toll bridge over the Housatonic River. The bill would have forced the Washington Bridge Company to make alterations to the bridge at its own expense even though the conditions requiring these changes did not exist when the bridge was originally built. The General Assembly overrode Baldwin’s veto, and Baldwin failed to win his party’s nomination for re-election. In the end, Clark Bissel, the candidate chosen by the Whigs to replace Baldwin, lost to the Democrats, while the Supreme Court ruled that the act was unconstitutional. After leaving the governor’s seat, Baldwin served in the U.S. Senate, where he was active in opposing slavery. He spoke out against measures such as the Fugitive Slave Act of 1850. Some of his positions upset Whig leaders in Connecticut, and since U.S. Senators were then chosen by the General Assembly, Baldwin was not elected again after 1851. He returned to New Haven and continued his law practice, becoming one of the highest paid lawyers in the state. He helped form Connecticut’s Republican Party and supported Abraham Lincoln’s nomination in 1860. In 1861, Baldwin served as a delegate to the National Peace Conference in Washington, D.C. The Conference was convened by the Virginia General Assembly as a final effort to avert the country from being embroiled in the Civil War. It was his last public service. Baldwin died in 1863 and is buried in New Haven’s Grove Street Cemetery. His wife Emily, who died in 1874, is buried beside him, as are other members of his family. His son, Simeon, later wrote that Baldwin was one of the last lawyers in the state to wear the old fashioned clothing featuring a full dress suit of black. This, he noted, gave the appearance to younger lawyers of a tradition that had long since disappeared. Adams, Charles F., ed. Memoirs of John Quincy Adams, Comprising Portions of His Diary from 1795 to 1848. Philadelphia: J. B. Lippincott & Co., 1874-77 [CSL call number E 377 .A19 Volume10]. The Annals of America. Chicago: Encyclopaedia Britannica, 1968-1987 [CSL call number E 173 .A793]. Baldwin, Charles Candee. The Baldwin Genealogy. Cleveland: Leader Printing Company, 1881 [CSL call number CS 71 .B19 1881]. Baldwin, Roger S. Argument of Roger S. Baldwin of New Haven: Before the Supreme Court of the United States, in the Case of the United States, Appellants, vs. Cinque, and Others, Africans of the Amistad. New York: S. W. Benedict, 1841 [CSL call number SpecColl E 446 .B18 1841]. Baldwin, Simeon E. Sketch of the Life and Character of Roger Sherman Baldwin. Reprinted from “Great American Lawyers” Philadelphia: J. C. Winston, 1907-1909 [CSL call number E 176 .L67]. Cable, Mary Black. Black Odyssey: The Case of the Slave Ship Amistad. New York: Viking Press, 1971 [CSL call number E 447 .C24 1971]. The Connecticut Register: Being an Official State Calendar of Public Officers and Institution. Hartford: Brown and Parsons, 1847-1886 [CSL call number SpecColl Conn Doc R 26b]. Cutter, William R., et al., eds. Genealogical and Family History of the State of Connecticut. New York: Lewis Historical Publishing Company, 1911 [CSL call number F 93 .C99]. Dexter, Franklin Bowditch. Biographical Sketches of the Graduates of Yale College…September, 1805-September, 1815. New York: Henry Holt and Company, 1912 [CSL call number HistRef LD 6323 .D5]. Dictionary of American Biography. New York: Charles Scribner’s Sons, 1936 [CSL call number E 176 .D56 v.2]. Dutton, Samuel W. S. An Address at the Funeral of Hon. Roger Sherman Baldwin, February 23, 1863. New Haven: T. J. Stafford, 1863 [CSL call number E 415.9 .B18 D9]. Garraty, John A. and Mark C. Carnes, eds. American National Biography. New York: Oxford University Press, 1999 [CSL call number CT 213 .A68 1999]. Green’s Connecticut Annual Register and United States Almanac. East Windsor, CT: Samuel Green, 1841-1848 [CSL call number SpecColl Conn Doc R 26b]. Jones, Howard. Mutiny on the Amistad: The Saga of a Slave Revolt and its Impact on American Abolition, Law, and Diplomacy. New York: Oxford University Press, 1987 [CSL call number E 447 .J66 1987]. Lanman, Charles. Biographical Annals of the Civil Government of the United States, During its First Century. Washington: J. Anglim, 1876 [CSL call number E 176 .L291]. Martin, Christopher. The Amistad Affair. New York: Abelard-Schumann, 1971 [CSL call number E 447 .M35 1970]. Morris, Dan and Inez Morris. Who Was Who in American Politics: A Biographical Dictionary of Over 4,000 Men and Women Who Contributed to the United States Political Scene from Colonial Days up to and Including the Immediate Past. New York: Hawthorn Books, 1974 [CSL call number E 176 .M873 1974]. National Cyclopedia of American Biography. New York: James White & Company, 1898- , s.v. “Baldwin, Roger Sherman”, vol. X, p. 336 [CSL call number E 176 .N27]. Owens, William. Black Mutiny: The Revolt on the Schooner Amistad. Baltimore: Black Classic Press, 1997 [CSL call number E 447 .O9 1997]. First Through the 104th Congress, March 4, 1789 to January 3, 1997. Alexandria, VA: CQ Staff Directories, 1997 [CSL call number GIS Ref JK 1010 .A5 1996]. Who Was Who in America. Chicago: Marquis-Who’s Who, 2002 [CSL call number E 176 .W64 1607/1896]. Wilson, James Grant and John Fiske, eds. Appleton’s Cyclopædia of American Biography. New York: D. Appleton and Company, 1887-1900 [CSL call number E 176. A655]. State Archives Record Group 6, Records of the Secretary of State, Statement of Votes, 1819-1919: Governors, 1819-1902, Volumes 11 – 17. Materials in the State Archives are subject to the Rules and Procedures for Researchers Using Archival Records and Secured Collections Materials. Many of Baldwin’s papers are at Yale University. 38″ x 45″ in its frame, painted by George F. Wright (1828-1881).